The Center for Urban Forest Research conducted a field study to better understand how trees contribute to making Sacramento's favorite neighborhoods so successful. What species were most planted and what were their characteristics? What were the typical planting configurations and how did these affect tree survival and infrastructure damage? What kinds of ecosystem services were the trees providing? How can landscape architects and urban planners use this information to create spaces where people want to live and where the urban forest can be most successful and provide the greatest environmental benefits? In every city, there are neighborhoods, like the park neighborhoods of Sacramento, that have stood the test of time; sought-after places where, decade after decade, families and individuals have chosen to make their homes. The goal of the first part of this study was to consider the role that trees have in creating this atmosphere. What kinds of trees were planted long ago and which have survived? How have they grown and what factors have influenced them over time? What is their relationship with the built environment they have been placed in? At the same time, designs for the neighborhoods of today must address the needs of the present. We ask that they be not only beautiful, but also healthy and environmentally valuable. Trees have a role to play in accomplishing this as well. The goal of the second part of this study was to consider the many benefits that trees provide and to suggest ways to maximize them through design. 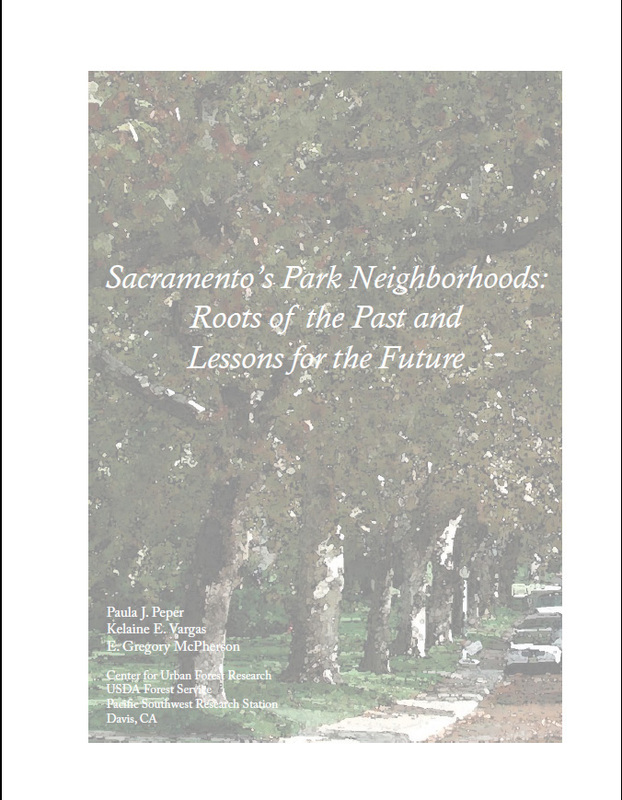 For the first part of the study, we began by assessing the five park neighborhoods of Sacramento – Oak Park, Curtis Park, McKinley Park, East Sacramento, and Land Park – through a broad “windshield” survey to determine species dominance, age, and general planting patterns. Representative street sections were chosen for more in-depth analysis. Data collected included tree species; diameter at breast height; tree height and crown diameter; estimated age; lot, structure, sidewalk, street, and curb and gutter widths; setback from tree to nearest pavement, to nearest structure, and to lot line; azimuth from tree to nearest conditioned structure; damage to sidewalks and driveways related to trees; and tree condition. By far the most common species was the planetree (Platanus spp. ), which represented more than half of all trees studied. Historical records show that several species, including P. orientalis, P. occidentalis, and P. acerifolia, have been planted over the years. Fifty-eight species comprise the other half of the plantings with the next most predominant being red maple (Acer rubrum), American elm (Ulmus americana), sweetgum (Liquidambar styraciflua), and deodar cedar (Cedrus deodora). Along representative streets, average tree size was a remarkable 33 inches in diameter at breast height, 78 ft in height, and 60 ft in crown diameter. The trees often dwarf the residences and provide a distinct sense of living in a peaceful, forested landscape. House setbacks from these large trees ranged from 9 to 67 ft with average setback of 26 ft. The setback for trees to the nearest hardscape (sidewalk, curb or gutter) ranged from 2.5 to 19 ft with an average setback of 5.4 ft. There were two main planting configurations for treescapes. (1) Trees were planted in planting strips located between the curb and sidewalk. Planting strips ranged in width from 4.5 ft to 15 ft. (2) Sidewalks were immediately adjacent to the curb, and trees were planted directly in the front lawn. Where trees were planted in planting strips, on average there were more trees per residence, but fewer survived from the original plantings, and many in the smallest strips were stunted. The size of the planting space was also correlated with the amount of adjacent sidewalk damage, with trees within 2–4 ft of sidewalks causing damage in 86% of cases and trees 10–12 ft from pavement not being associated with any damage. The pattern emerging from this study was trees planted in larger spaces were larger and lived longer. In the second part of the study, we began by looking at the ecosystem services that trees provide, including energy conservation, air pollutant and greenhouse gas reductions, and stormwater management. Plant the largest tree possible for the available growing space. Concentrate planting efforts on the western and eastern sides of buildings. Select species with large leaf surface area, long leaf stems, hairy plant parts, and rough bark to intercept more air pollutants and more rainfall. Wherever possible, treat the tree and the soil it is planted in as a mini-stormwater reservoir to maximize rainfall interception. Provide each tree with the best possible planting conditions, including an adequate volume of good quality soil, and the best early care to set it on the path to a healthy and long life. Allow for age and species diversity at the large scale to protect the urban forest against threats from disease and pests. Where trees are planted close together to maximize early canopy, a management plan should consider recommendations for removal once trees begin to impinge on each other. By studying the patterns of planting and survival over the past 100 years, we have uncovered a great wealth of information about how a sustainable urban forest grows – how much space trees need to reach their full potential, which species stand the test of time, how trees and homes work together to create a forested atmosphere. By combining the historic data with current knowledge about the ecosystem services trees provide and how we can best maximize those benefits, we have the opportunity to create new neighborhoods that offer the best of both worlds: the historic grace of the past and the environmental values of the present.